Do Birds Flying Into A Home Equate To Death? Home > Old Wives Tales > Do Birds Flying Into A Home Equate To Death? Birds have long thought to be associated with otherworldly powers - not other planetary but other worldly, as in the spirit world. Their ability to fly far and high in ages gone by gave them a mystical quality that many looked to for signs and portents, and one of the most common 'bird omen wives tale' was that if a bird flew into your house through an opened door or window, death was not far behind. In a home lies a sickly person, with family members standing vigil nearby. The health of the ill is in question and everyone is concerned that things could take a turn for the worse. A sudden rapping at the window of the sick room causes a start and those in the room turn to see a black crow sitting on the sill, tap, tap, tapping at the glass. Its insistence is unnerving - what does it want? Eventually the crow flies off, but not before leaving the concerned family members with a chilling superstition that their loved one is doomed to die. The variations on this theme are many, but all fairly consistent; a bird tries or succeeds to get into a home, and this is considered a sign of imminent death. In some versions the bird strikes the window in flight (sometimes getting up and doing it again) or lands on the sill and strikes the window with its beak. Other versions have the bird enter the home through an open window or door. Should a bird get access to the interior of a home with no visible means of entry, the superstition is that it is equivocal to an intruder alarm tuned to sense death itself going off. There is no one source of the 'bird flying into house equals death' wives' tale, but it is a common enough superstition nonetheless. In days gone by people were prone to look for many superstitious or mystical answers to every day questions, and some questions that were not so run of the mill (such as “why must my loved one die?”). When something out of the ordinary happened people were quick to ascribe to it some mystical significance, whether or not there was a logical, natural explanation to it. Any time a bird flies into a house it certainly is an unusual experience. Birds, being creatures of the outdoors and mainly shy of man to boot, do not typically try to get inside a dwelling. Some may get confused, thanks to an expertly cleaned glass window and give itself a braining on a house. 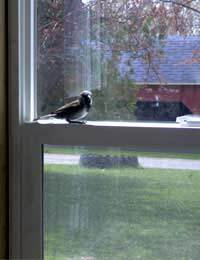 Others may land on a handy window ledge and peck at its own reflection out of curiosity. As for a bird flying in through an open window, taking a break on a chair back, and then leaving, who knows? But it certainly is behaviour convenient to attach a sense of a message being delivered. No Birds In My House! The idea of birds being associated with death is very strong in some people, to the point that they won’t have decorations of birds in their home. One famous report has actress Lucile Ball tearing wallpaper out of a new home because she discovered little birds in the pattern that she didn’t notice before. Carrying on with the bird theme why not take a look at our superstitious article about Saluting Magpies. One week ago pigeons flew through my door and one flew upstairs into my bedroom and the other into our laundry room. I chased them both out of the house leaving the door open.Today which is one week later another pigeon flew into my house and upstairs into my bedroom. Both times I found the pigeons sitting on my bed. I have been told that if a black bird flies into your home it is a sign of death. I know pigeons are messengers and I just recently lost my daughter. I have had artificial butterflies land at my feet and I have seen feathers at my door. Does this mean that she may be trying to communicate with me or give me a message? Spiritually I need answers is this is alarming to me. What does it mean when a robin tries to get in the house? For the last week it’s been hitting the screen door in front an back and also the window. hi so last night i was in my room asleep and my sis said a bird flew in and got hurt by the glass it failed on and my dog got it until it died from the glass and then put it on my little sis bed does this mean one of us will die? My Husband died 3 months ago and as i was staying with my Daughter for christmas and the new year for company.on new years eve a robin came in to her house through the door, it flew around and around and would not leave my daughter left the door open so it could get out. i hoped that it was my late Husband as he always loved birds and i loved robins, i hope this is true as he loved my Daughter as she was his step daughter, did he come in to tell us he was around minding us or is me just hoping.mag's. I had two small birds fly into our home this evening. Took some time to get them out but did so safely. Anyone have thoughts or comments? A crow came down our chimney , it took a while for us to get it out , the next day we got news my dad had terminal stage 4 cancer .. It was devastating news.Only today a magpie came down the chimney .... Hopefully I will get good news not bad ???? A bird was in my master bathroom today, flew into the hallway, up to the ceiling light. I went in my bedroom & shut the door. I stayed in my room about 20 minutes. I opened my room door, not knowing where the bird went. I shut all the room doors, remai ing un the hallway. I dont know where the bird went. A friend came over looked in the rooms & couldn't locate the bird. He said maybe it was a sign. I then googled this site. I keep having dreams of my husband dying. We've been seperated for 2-1/2 years. Today a young Blue Bird flew into the Bedroom, he was not upset but stayed a while and left. Last time a Bird flew in like that it was a Blackbird and it sat on the Taps in the Kitchen, my Mother had died and Dad said that has Mum come back to say she is happy!I am very Spiritual and rather than Bad Luck I think Birds come to us to let us know family on the other side are happy.We do have 3 rather sick friends and family around at the moment but if it happens then I KNOW they will be Free. Hello so today a magpie flew through my back door into my kitchen window then flew back out all is fine.... So I told my bestfriend and she messages back saying that half hour before hand she had a parrot in her lounge room. Never happened before. Anyone know what it could mean? My son died of an overdose. We were at the hospital nonstop 4 days as the doctors waited to be 100% certain he was brain dead before they turned life support off. When they did, we arranged to have his organs donated. That night when we got home, before bed we let our dog out. When the front door was opened, a bird flew in. The timing of the bird about matches the time when they would have finished harvesting his organs. I 100% believe that it was a message that his soul was free. So this morning I woke up to aloud noise. My first reaction was to say “what the ****” but then again I’m 17. This woke my sister. So I yell for my mom in the next room and she said it indicates death....which would make sense since my 19 year old brother and father work in the log woods and my nearly 70 year old grandfather are in the hospital...just a little worried. On the 4th ot July a Black Pigeon flew down from a tree and flew right to my husband he was looking on his phone, the bird went and looked at the light on his phone and walked away. Walked back to him and just stood there. It then flew and landed on my 2 year olds head. She screamed and it flew to a tree. A few mins later it flew back to my husband and it stood there for about an hour just walking on the table. We do not have black pigeons in colorado. We thought it was weird and had a weird scared feeling it seemed not right. Well 3 days later our family dog was run over by a motorcycle in bloody massacre style.. meaning blood everywhere (driver was fine not his bike though). She was like a child to us she was an english bulldog. We feel this bird was a symbol of her death. My mom actually kept the dang bird as a pet. Tonight I came into my home and went to my bedroom. When I pulled back the covers there was a brown bird. It flew around my room and tried to hide. I then closed my doors and opened my windows. I feel such a Amazing Overwhelming sensation of Great Spirits in my home. I believe that if you put the energy out into the universe about death then it will come. Adventully we all are going to die or know someone that has passed so Create Positivity and stop looking for the worst when you can look for New Ventures and Blessings. @SpiritualOcean- I think crows live in cemetries because of the particular mature trees found in cemetries and you can't really connect a death four months later. A bird came into my house a year ago and no one ever died. I think it's just coincidence and if you look for a coincidental pattern you will find one anywhere. @Pebbles - the bird probably just lost its bearings for a second.